The sea seems to be impatient in this winter morning. FB Salma, a wooden fishing boat that has been modified into a dolphin survey vessel, is moving up and down in the rhythm of the ocean. The strong breeze has lowered the temperature, even though the sun is shining high up in the sky. Two researchers of the Wildlife Conservation Society (WCS) are standing on the highest point of the boat searching the moving surface of the water with their binoculars. The Salma is on its way to the deep submarine canyon in the northern Bay of Bengal called the Swatch-of-No-Ground. This more than 900 metres deep canyon beginning about 40 kilometres south of the Sundarbans mangrove forest, is home to thousands of marine mammals. Every half an hour, principle researcher Rubaiyat Mowgli Mansur asks for “pani”, whereupon a member of the crew fills a bucket with sea water and passes it to the upper deck. The researchers measure salinity and temperature, jot down the condition of the sea, the visibility and the depth. The data will be entered in their laptops in the evening. The last measurement shows a depth of about 50 metres. The expedition has reached the cleft. “Who will see the first blow?” Rubaiyat asks, and keeps on watching the surface. But nothing happens. The chef keeps on chopping vegetables for lunch, Master Saheb steers the boat. The radio is tingling, the diesel engine is rattling, the wind whistling. Suddenly, a call slices through the silence: “Sighting!” Rubaiyat shouts. All the binoculars instantly swing to the same direction. Rubaiyat has sighted a fin. On his command, Master Saheb turns around the boat and steers the Salma towards the spot, where the shadow has appeared. By now the other members of the crew have spotted the animal – not only one, but a whole group of dolphins drifting peacefully under the surface. Second researcher Saikat grabs a pen and notes down every detail: sighting coordinates, water temperature, number of animals and species. The crew has found a group of Indo-Pacific bottlenose dolphins (Tursiops aduncus) – which is exactly the species the researchers were hoping to find. This winter their work focuses on these animals. In only a short time “Salma” finds herself surrounded by a dozen animals. Some of them only show the tips of their fins, making them look a bit like sharks. Rubaiyat has changed the binocular in favour of a camera and starts shooting. He wants to take pictures of the fins; these are like human finger prints. By comparing the photos, the researchers can identify individual fins allowing them to estimate the total number of the species in the Bay of Bengal. "Oh, we know this guy," Rubaiyat suddenly shouts with a smile an his face, "We have identified him before." The dolphin's fin is strangely frayed. This mutilation was most probably caused by a rope or another part of a fishing gear. Of the dolphins that have been identified in the last few years, about 28 percent bear injuries definitely related to entanglements with fishing gear, Rubaiyat explains. “Some of the scars could also be caused by shark bites,” he adds. 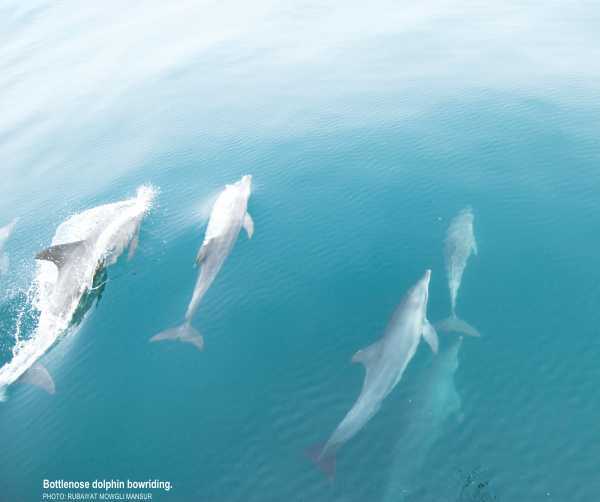 During the winter seasons of 2005-2009, Bangladesh Cetacean Diversity Project (BCDP), a project of the Wildlife Conservation Society (WCS), could identify 1,144 individual dolphins by comparing 10,000 pictures. The researchers assume that the identified animals are part of a larger super-population moving in a more extensive geographic area. But since the Swatch-of-No-Ground continues into India, the researchers can only guess how the population looks further south. A second group of bottlenose dolphins has joined the first one by now. “There must be about 30 to 40 animals,” Rubaiyat estimates. Some of them are so close as if one could touch them. "Let's see whether they want to bow ride," Rubaiyat says. And with a short single ring of the bell, Master Saheb gives the command to speed up the boat. Indeed, the animals want to play. Several dolphins follow the Salma and keep on swimming directly under the bow. They show their sides and look at the people bent over the railing as if they wanted to inspect the clicking cameras. They break through the surface with short jumps, take a deep breath, dive and keep on bow riding. "Hey Bhondu!“ one of the engineers calls out to a dolphin that swims directly towards the Salma. Even the chef has left his tiny make-shift kitchen in the belly of the boat to watch the adorable animals. "Dolphins are wonderful," Rubaiyat says, "They make everybody smile." Even for him, an experienced researcher and wildlife photographer, it is overwhelming to see these curious animals. "Somehow, they have become like a family.” On days like today, when the wild mammals come so close to the boat, Rubaiyat has the impression as if they can recognise the crew. With a smile he adds: "Maybe they missed us, too.” His fascination for the doubtlessly beautiful animals is the main reason why he wants to protect them. "If fishermen ask me this question, I explain to them how much similarities there are between the dolphins and us. They give birth like us and they need air to breathe – just like us. They have their place in the world." Rubaiyat and the team of BCDP instruct fishermen to always keep an eye on their nets to make sure that the dolphins don't get entangled. 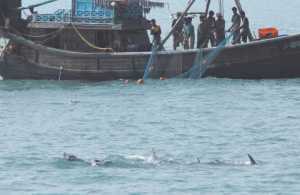 The nets are very expensive and the animals get drowned within minutes when they cannot get to the surface to breathe. Sometimes, it happens anyway. “I have met fishermen who said that they cried when they found dead dolphins in their nets,” Rubaiyat explains. After half an hour that seemed like only seconds, Rubaiyat decides to leave the place. "Let's go,“ he says, "We have to find more." Master Saheb speeds up. The population of bottlenose dolphins in the Bangladeshi part of Swatch-of-No-Ground seems to be healthy. "So far our research indicates that the population found in Bay of Bengal is among the largest assessed of this species,” Rubaiyat says. The animals take advantage of the high productivity created by upwelling currents along the Swatch-of-No-Ground's edge. Nevertheless the species' near-shore distribution makes it vulnerable to environmental changes and conflicts with fishing operations. The BCDP team would like to find out more about the species. Since the researchers can only do their fieldtrips during the winter, information on the summer months is missing. They do not know whether the animals stay in the Bay of Bengal during the rest of the year or if they are migrating. “Whenever we have the chance, we talk to the fishermen and ask them about sightings of dolphins and whales,” Rubaiyat says. Since the fishermen also go to the sea during the stormy summer months, they could provide important information to the BCDP. One idea is to supply fishing vessels with GPS and ask fishermen to write down dolphin sighting information. But so far, there are no funds for such an initiative. Rubaiyat and his team have three months time to do research on the bottlenose dolphins at the Swatch-of-No-Ground. In addition, information about other species is collected, for example the Indo-Pacific humpback dolphin (Sousa chinensis), who inhabit the shallow, medium salty waters between the Sundarbans and the Swatch-of-No-Ground. It is another part of the BCDP work to count the fishing vessels in these waters. 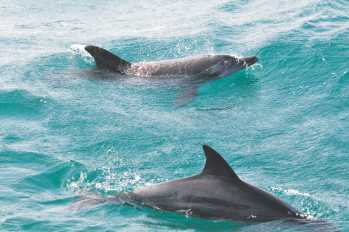 It is already late in the afternoon, when the researchers suddenly come across another big group of bottlenose dolphins. Some are jumping from wave to wave, moving closer to the Salma. The procedure is the same: clicking, jotting down the data, moving onto the next place. A single dolphin follows the boat for about half an hour after the last picture has been taken. Suddenly, a murmur ripples through the crew. Someone has spotted a water column, quite close. "Bryde's whales," Rubaiyat says, "two of them." He immediately asks for acceleration. All the attention is now focused on these two giants swimming about 200 meters in front of the Salma. Two seabirds are circling over the whales' blows as if they wanted to take a shower in the misty spray. A third fin has joined the two big ones. It belongs to a bottlenose dolphin. Suddenly, the animals dive. The Salma heads towards the place where they have been spotted last. "Three minutes,” Rubaiyat counts, "Four minutes." Still no whales in sight. “Where are you?" he asks. Out of the blue, the longed for blow appears followed by a short wink of the fluke. Again the Salma follows, again the whales dive. Meanwhile, dozens of dolphins have joined the chase. One of them jumps several meters high. But then, the crew spots something different in the water: something white. It is a plastic canister bobbing up and down on the surface. Rubaiyat decides to go and get it. The canister is a part of the disposed fishing gear that can be harmful to marine mammals. Earlier, this morning, the crew had picked another “ghost net” from the ocean; an abandoned monofilament gillnet drifting with the tides. Some of the dolphins are still around, but the sun is already on her way to set. The principal researcher decides to end the day's work. "Shesh", he says. And as “Salma” drives back to the shallow waters the last dolphin fin disappears in the deep blue sea.